Do you want a flight simulator but don’t want to spend too much time and money buying and installing software, add-ons, and hardware? Just click here and go! Geo is an online flight simulator with worldwide satellite images. The sim is free, the satellite imagery at standard definition is free as well. GeoFS runs on 10–60 meter global Sentinel-2 satellite images. You can pay a nominal price for global HD aerial imagery: €9.99 for 1 year. Check out their Facebook page. Created by Xavier Tassin, GeoFS was launched in October 2010. 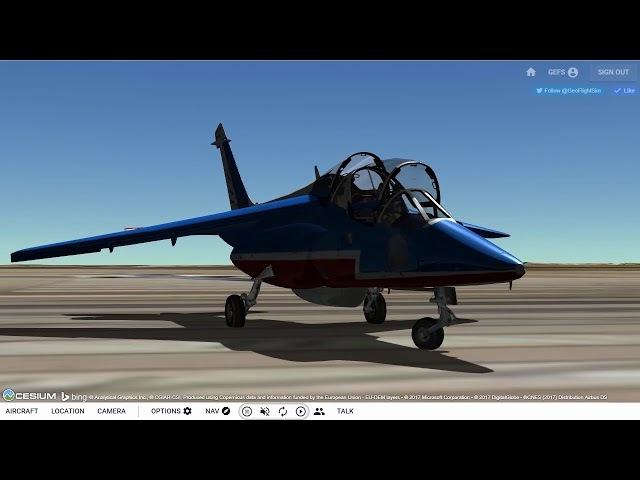 It was originally built on the Google Earth plug-in as GEFS-Online (Google Earth Flight Simulator). On September 1, 2015, support for the Google Earth plugin ended, which nearly resulted in a complete shutdown of GEFS-Online. In January 2016, in light of the Google Earth plugin’s termination, GEFS-Online migrated to CesiumJS, an open source virtual globe platform. From the Piper Cub to the Airbus A380, the range of available aircraft should interest every aviation enthusiast. Community members (see the Forum) also actively contribute to GeoFS by building new aircraft or developing plugins to enhance the existing features. GeoFS is a multiplayer flight simulator displaying a global scenery from satellite images. Whether you are a licensed pilot practicing VFR, an aviation enthusiast or just looking for some fun flying in beautiful landscapes, you can enjoy detailed aircraft with instrumented cockpits, ranging from gliders to airliners, absolutely anywhere in the world. Pick a runway from the 30,000 available on the navigation map and fly next to real commercial traffic (ADS-B) with actual weather conditions, during the day or at night.